Fire Truck Santa a few years ago. Last night Fire Truck Santa finally came by. I had been waiting for him all day. It was dark by the time he arrived in his sleigh aboard a flat bed trailer, pulled by the local fire department's truck. Poor Santa, no snow for his sleigh. He used to come by as pictured above but he's been upgraded in the past few years to a more comfortable ride. I have to say that had I seen this sight as a child I would have been entranced and delighted. Santa! Oh heck, I'm still delighted even if the fire trucks do make a lot of noise on our quiet little cul-de-sac. Santa arrives with flashing lights and sirens you can't miss him. I was in my "house only" slippers and thought I would be satisfied peeking through the curtains. But I wasn't. I grabbed a $20 bill from Rick, turned on our outside driveway lights and headed up to the street. He was stopped at our neighbors at the end of the cul-de-sac and I couldn't really see what was going on. I was hoping that either the Corbetts or the Murrays were also contribuitng to the Christmas cheer. It took them a long time to finish whatever was going on, but the truck finally pulled up next to me. Santa was not in his sleigh but sitting in the passenger side of the truck. I jokingly asked him why he wasn't in the sleigh and he said "Santa's pooped out!" He had his beard and hat off by then. I guess he figured I was grown up enough not to care. But I sort of did. I told him that I'd been watching for him all day and that they were late this year. He said there were just so many kids out this year that it took longer than usual. We were their last stop before heading back to the station. I told him that our house was sold and we were leaving so I wouldn't be seeing them next year. He said he was sorry to see me go, we'll miss you, he said. He asked a few more questions like where were we moving and the like. I told him that I had thoroughly enjoyed his visit each year and I'd miss him too. 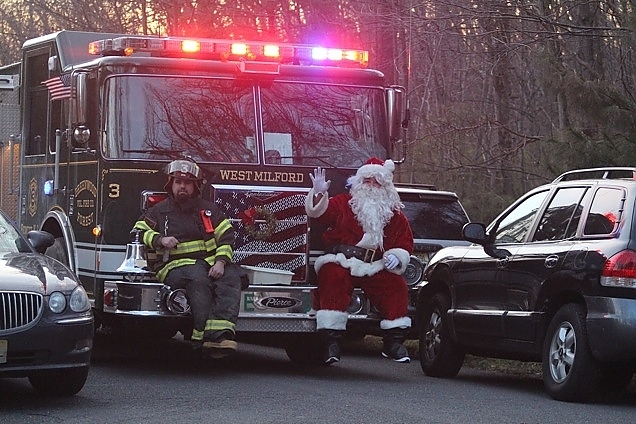 Really, if a volunteer fire department solicits for donations, what better way than Santa in a sleigh? I love the whole idea of the Firetruck Santa and had forgotten about it until I read this post. How did you know when they were coming? I guess it is publicized ahead of time? Wish I had been there! I would be out by the road in my slippers, too. Bring on the lights and sirens! This is such a New Jersey thing. We used to see similar Fire Department Santas each year when we lived there, in many of the little towns around us. Maybe there’s one in Wyoming, though he’d had a long way to drive! Next entry: Merry Christmas (and more importantly) Happy New Year!